A constellation of symptoms (and some signs) which are related to a relative lack of tears or moisture in the tear film which rests on the cornea of the eye. 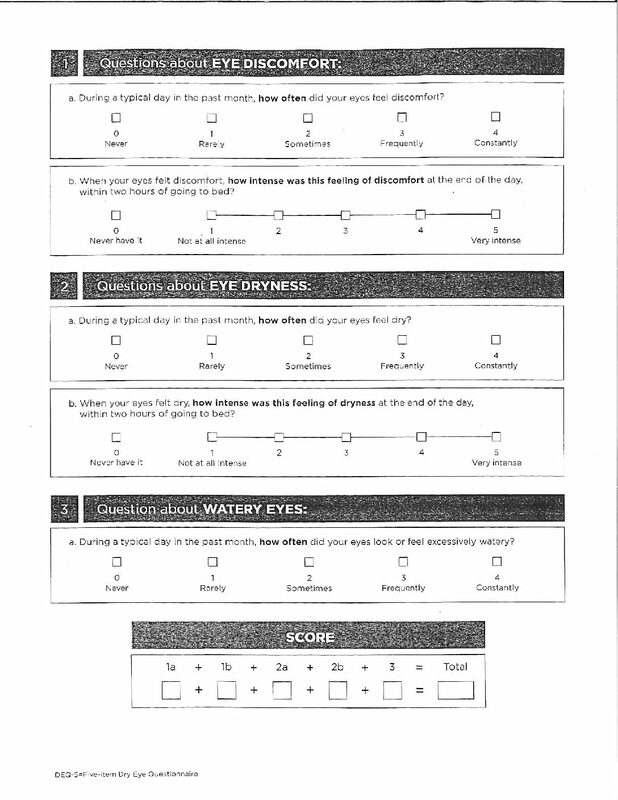 Some of the many symptoms which are caused by dry eye disease include: burning, stinging, itching, tearing, light sensitivity, eye pain, sandy/gritty feeling, heavy eyelid feeling, discharge, mattering or caking of the eyelashes/eyelids, redness, and blurry vision (especially when concentrating on a computer or cell phone, when reading or when driving for sustained periods of time). This deficiency is because some people are not able to produce enough tears, are unable to produce tears of a sufficiently normal quality or have features of their functioning which promote rapid evaporation of the tear film. Most patients cannot be cured of this condition, but many can be successfully treated in such a way that they can live with dry eye disease without symptoms or with their symptoms being kept to a minimum. There are many different causes of dry eye disease, and the most successful treatment regimens for patients are those which are tailored to the individual patient. Treatments range from the usage of artificial tears (replacement therapy), to Omega 3 free fatty acid supplementation, to eyelid wipes, to hot compresses, to punctal plugs, to prescription medications (Restasis & Xiidra), to office procedures such as Blephex and Lipiflow, among other treatments. Most patients will be best treated via a combined approach, incorporating a few distinct approaches to achieve the best possible results. Contact your doctor if you think you may have dry eye disease.